If one goes through most textbooks on solid state physics such as Ashcroft and Mermin, one can easily forget that most of the solids in this world are not crystalline. If I look around my living room, I see a ceramic tea mug nearby a plastic pepper dispenser sitting on a wooden coffee table. In fact, it is very difficult to find something that we would call “crystalline” in the sense of solid state physics. What you can already see forming within this simple picture is the notion of a “band”. Each “band” here only contains two energy levels, each of which can take two electrons when taking into consideration spin. If we generalize this picture, one can see that when going from two wells here to N wells, one will get N energy levels per band. Again, this can be generalized to N potential wells that vary in height from site to site for one to get a “band”. The necessary requirement for band formation is that the electrons be allowed to tunnel from one site to the other, i.e. for them “feel” the presence of the neighboring potential wells. 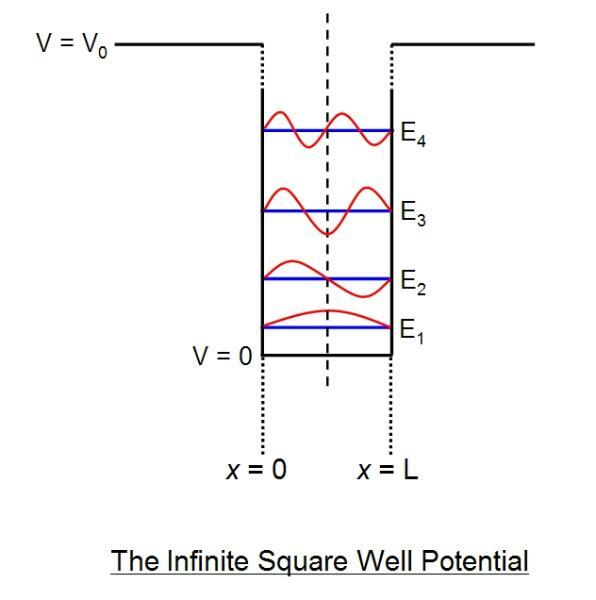 While the notion of a Brillouin zone won’t exist and nor will Bragg scattering of the electrons (which leads to the opening up of the gaps at the Brillouin zone boundaries), the notion of a band will persist within a non-crystalline framework. Because solid state physics textbooks often don’t mention amorphous solids or glasses, one can easily forget which properties of solids are and are not limited to those that are crystalline. We may not know how to mathematically apply them to glasses with random potentials very well, but many ideas used in the framework to describe crystalline solids are applicable when looking at amorphous solids as well.